I was soooo much interested to sneak at sets of Dil Dhadakne Do. I present to you interview of one of the many girls who worked as extras in the film. Yes yes the ones you see in background of films, when main actors are in main frame and extras are doing their job in background in scene to make film scene look realistic. This will be the first interview on R&W from many more. We have always read what stars, big actors have to say. Lets read from a normal person like you and me point of view. I always wanted to know what extras have to say about a film in which they are working. Let me introduce my first interviewee. Her name is Larissa and she has acted in Dil Dhadakne Do. What she has done in the film, what was her experience and everything here. This is the exclusive pic from the sets. Larissa - I'm a Brazilian woman, graduated in Communication and Tourism Management. I live in the South of Brazil and after finishing my Tourism graduation, I decided to change my life by trying to apply for a cruise ship job. After the approval, I started working on Sovereign, from Pullmantur, in 2014 European season, as a bar waitress. I'm always trying to find something different to do with my life, since this world is full of opportunities. Who knows how my future will be. I love speaking English, meeting people, travelling, exchanging knowledge about everything, knowing other cultures and goes on. R&W - How did you landed on sets of Dil Dhadakne Do? Larissa - On the ship, our bosses told us that the movie production was looking for extras to fill the spaces on the sets of the scenes. They told us that we could be part of it, as long as this didn't interfere on our ship job schedules. 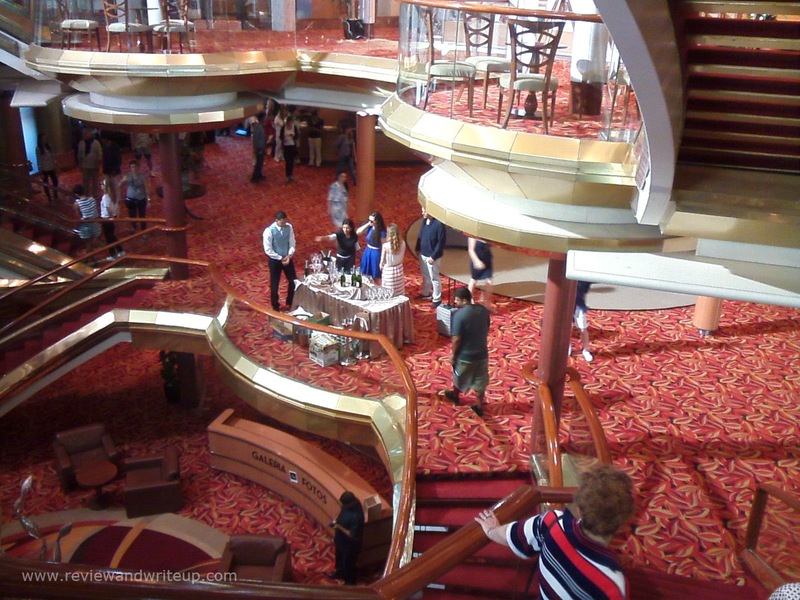 The movie brought extras on their own, but still it wasn't enough, because they had to fill the sets, to make it believable to people that there was a cruise going on, full of passengers. R&W - What is your role in the film? Larissa - As an extra, I didn't have a role, my function was to do what the co-director (I think) and the other directors said: to be "normal background people", to give the impression that the ship was functioning like a cruise trip. So, I played a lot of "roles": a girl and her boyfriend walking to the bar, a girl and her friends sitting on tables enjoying "drinks" and pretending to be talking, a girl and her friend sitting on some other table also pretending to be talking and drinking, again, me and other 3 people on a table close to the band, and, the last one was at the bar counter (this was the closest I was from the 2 young major actors), where I was sitting on a bench at the bar counter and my "supposed boyfrend" arrived and payed me a drink. It was super, very cool and I was so happy! R&W - You worked in any other film before (Hollywood/Bollywood/any other)? R&W - What was your experience with Dil Dhadakne Do Cast and Crew? Larissa -The cast I almost had no contact at all, because I was just on a few scenes, recorded only in one day. But I know of people who recorded everyday and they were much closer to the actors and actresses, taking pictures with them and everything. I was stupid enough to not carry my cell phone and I don't have a single picture with any of the actors (sad). BUT I did gave the dog a HUGE hug, every time I saw him passing outside the open area. From the movie crew, the coolest guy was the one who was responsible for all the extras from the ship, Abhishek. This guy was really nice and treated us very well. R&W - Did you get paid? Larissa - Yes, we all got paid a small amount in Euros, per day of participation. I think It was 40 Euros a day. R&W - Did you danced in any song? How about costumes and makeup (you have to arrange your own)? Larissa - No, I didn't dance, because I was one of the people sitting on the tables "talking and drinking". The costumes and make up were arranged by the movie production, they chose the outfit (they gave me a huge black dress, hahaha) and I had my make up made by the movie crew. They said I looked beautiful, but I never saw me, hahaha. R&W - Were you directed by main director or assistant? R&W - Any kind of policing for extras on sets? Larissa - Just the obvious one that was the "silence" rule, while the scene was being filmed. People do talk a lot, and even with the request for silence, sometimes the assistants had to really yell at people not to talk or make any noise during the recording. R&W - Were you allowed to approach film actors? Larissa - Not during the filming, I guess. But anyway, I didn't try it, so I don't know how to answer. I do know that during the breaks, the crew took the time to take pictures with the actors. R&W - Who was your favorite actor among main star cast on sets and why? Larissa - Hunmmm.... Well, as I told you I really didn't talk to any of them, the only one that I was really attached to was the dog, I loved that dog, so I would have to say: the dog. But I saw Priyanka Chopra live, and OMG, she's so beautiful! R&W - Ever seen any Bollywood film before? Larissa - Yes, of course. But I don't remember the names. The most famous one, of course, Slumdog Millionaire. The last one I saw was "Taare Zameen Par", don't know if it's Bollywood, but I cried like a baby, I think it was one of the most beautiful movies I've ever seen. R&W - Will you be watching film? Now you know why there are not so many pictures from sets. I respect privacy of others and I understand the kind of hard work a director, actors, whole cast and crew put in to make a film. Did you like the interview? Please share your comments in comments section below. It means a lot to me.